"The Mightiest Heart" retells for young readers Wales' beloved legend of the loyalty displayed toward Llywelyn the Great by Gelert, his wolfhound. Dogs are as important to royals as they are to commoners. 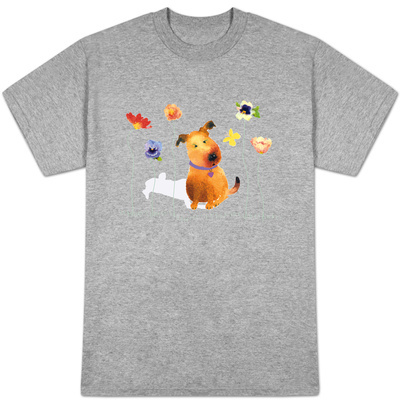 One of the most moving of dog stories is that of the loyal love of Gelert the brave Welsh wolfhound for Llywelyn, the valiant Prince and King of Wales. The Mightiest Heart is part of the folklore of the beautiful country of Wales. The Welsh people are among the world’s most fascinating historians, poets and storytellers. No one knows their history better than the Welsh. One of the most beloved topics relates to Lywelyn the Great (1173-1240). 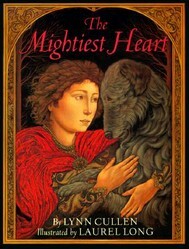 Prince Llywelyn’s love for Gelert the wolfhound indeed is the subject of The Mightiest Heart, written by Lynn Cullen, illustrated by Laurel Long, and published by Dial Books for Young Readers in 1998. The story is the first picture book authored by adult and young-reader novelist Lynn Cullen. Laurel Long’s illustrations won the book the Society of Illustrators Gold Medal. The book begins with Llywelyn’s youth in the Welsh mountain castle of Snowdonia. Llywelyn’s pastimes include chasing meadow hares, climbing trees, and counting stars. He likes these activities even more than eating jellied eel and roast peacock. They represent activities which he does with Gelert. But Llywelyn cannot remain a carefree child. With maturity, he has less time to spend with Gelert. Llywelyn must learn how to fight and win wars. Llywelyn asks to marry King John’s daughter, Princess Joan. Gelert looks most festive at the celebrations in Snowdonia’s Great Hall. A red rose in his collar rests against Gelert’s strong but gentle, handsome and noble jaws. With the birth of the couple’s son, Llywelyn has no time at all for Gelert. Gelert is confined to the courtyard. But one day, Gelert manages to get into the palace nursery. Llywelyn gets as excited about playing with Dafydd as he once did regarding Gelert. He hurries into the nursery that day, to find Dafydd’s empty cradle blood-stained. Gelert is bloodied about the jaws. In this version, Gelert escapes before Llywelyn can stab him. Llywelyn then finds Dafydd unharmed. The wolf that tried to eat Dafydd is dead in the corner, thanks to Gelert. Gelert never comes back home. But one day, Llywelyn is attacked by a wolf out in the woods. He returns briefly to consciousness to find Gelert wounded and the wolf dead. He finally wakens to find Gelert gone. Llywelyn builds a stony mound as tall as himself. The mound commemorates Gelert’s last known appearance. Gelert’s memory is assured by the mound … and by his pup son that Dafydd finds. The Mightiest Heart is written and illustrated in such a lively, loving fashion that readers of all ages will want a permanent copy of this wonderful retelling of Gelert’s love for Llywelyn.